Festive traditions taking in church, charity and Christmas lunch helped bring the Autumn Term to a suitably seasonal end. The Service of Nine Lessons & Carols at Chipping Barnet Parish featured Christmas music spanning the centuries. Boys and staff raised money for local charities seeking to help the disadvantaged. And the penultimate day of term brought the ever-popular full Christmas lunch in the Dining Hall. At the Carol Service, the congregational singing began with Once in royal David’s city and ended with Hark! The herald angels sing. Interspersed were musical offerings from the Chamber Choir and the School Choir, including their respective renditions of the modern A Child is born in Bethlehem by Malcolm Archer and John Rutter’s Christmas Lullaby, as well as an introit by 16th-century Renaissance composer Palestrina, performed by the Chamber Choir. 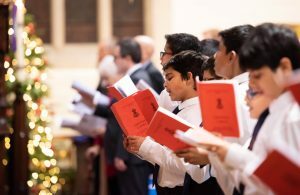 The ‘nine lessons’ (Bible readings) were read by a boy from each year, including School Captain Aashish Khimasia, and by staff, culminating in the Headmaster’s traditional Christmas contribution from the opening chapter of St John’s Gospel. The service was preceded by a short reception for staff past and present, and for governors, members of The Friends of Queen Elizabeth’s and alumni. The reception was held close to the parish church in Tudor Hall, Wood Street, the historic home of the School until it moved to its present location in 1932. While charity work takes place throughout the year at QE, a special effort is made at Christmas, the traditional season of goodwill. This year, there was a collection for the local food bank and for a local homelessness charity. Boys and members of staff contributed over a week-long period, and a large volume of donations was made. These charity efforts were organised by Head of Extra-Curricular Enrichment, Rebecca Grundy, with the assistance of prefects. 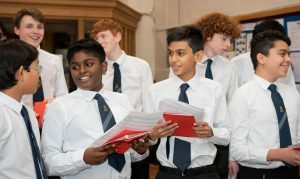 In addition, in line with recent QE tradition, boys from the School Choir went out carol-singing in aid of Cherry Lodge Cancer Care in Barnet. It is beginning to look and sound a lot like Christmas at QE…with the School community gathering for the annual Christmas Concert. 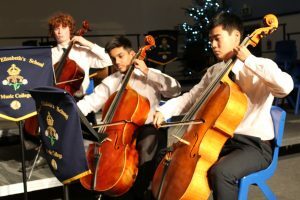 The event featured a broad range of festive performances, from the traditional Coventry Carol to the considerably more modern Harry Potter Symphonic Suite. Headmaster Neil Enright said: “This was a very enjoyable evening, with strong performances showcasing the considerable strength and depth of musical interest and talent at the School. 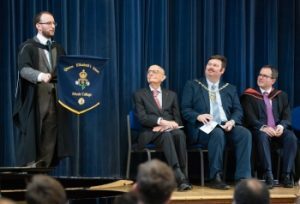 The event was presented in association with the Barnet Rotary Club, a partnership which has endured for many years, and was well supported by QE families, staff, governors, and a number of Old Elizabethans, as well as guests associated with the Rotary Club. The School also welcomed The Deputy Mayor of the London Borough of Barnet, Councillor Caroline Stock, and her husband, Dr Richard Stock, who is himself an Old Elizabethan. Mr Jim McCarthy, President of the Barnet Rotary Club, welcomed the guests and spoke of some of the local charitable causes the club supports, including the Noah’s Ark Hospice and a Christmas Day party for the elderly. The concert then began with All I want for Christmas is you from the Year 12 Ensemble, followed by O Come, All Ye Faithful, for which the audience were invited to join in the singing. The Senior Indian Ensemble performed Sabhapathiku; their performance was followed by Mr Santa from the B Minors. Have yourself a merry little Christmas from the Chamber Choir led into the interval, during which mince pies were offered to the guests and the traditional Rotary Club raffle was drawn. The concert ended with the traditional carol, Hark! The Herald Angels Sing, in which the audience again participated. This concert, along with the traditional Service of Nine Lessons and Carols at the parish church, is one of the two major musical events of the season. 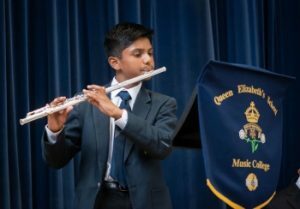 Many of QE’s younger musicians performed in a concert entitled The Show Must Go On – the first of the academic year. The Music Department event in the Shearly Hall featured around a dozen ensembles drawn heavily from the Lower School. 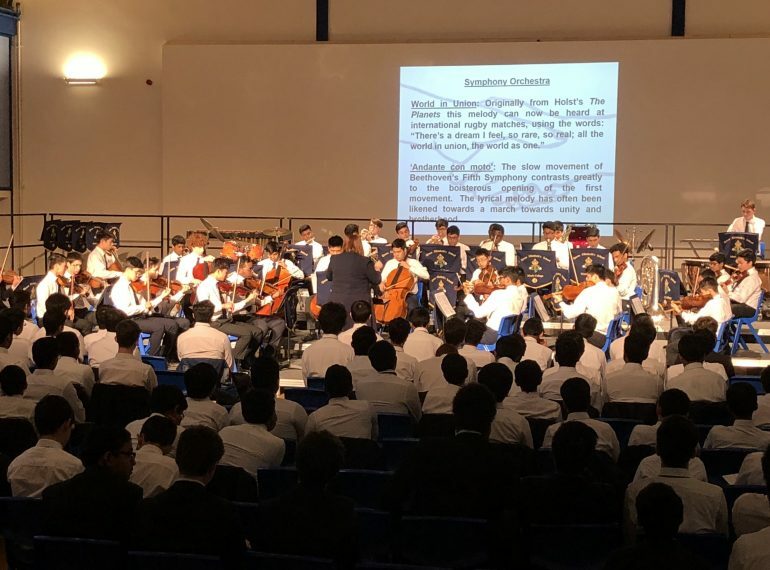 And even though one – the Guitar Ensemble – was unable to perform because of a technical problem, true to the theme of the evening the other performers valiantly played on to deliver the rest of the programme. 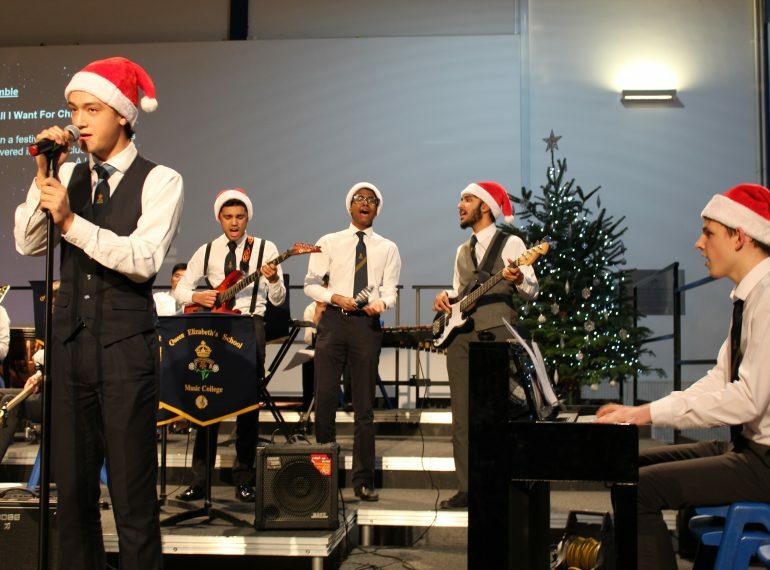 Headmaster Neil Enright said: “This was a very good concert, amply demonstrating the strength of Music at the School in both breadth and depth, as shown on the one hand by the high levels of musical participation – around 100 boys performed in the School Choir alone – and on the other by the talent that was so evident on the night. Music teacher Jennifer Brown paid tribute to the boys playing publicly for the first time. 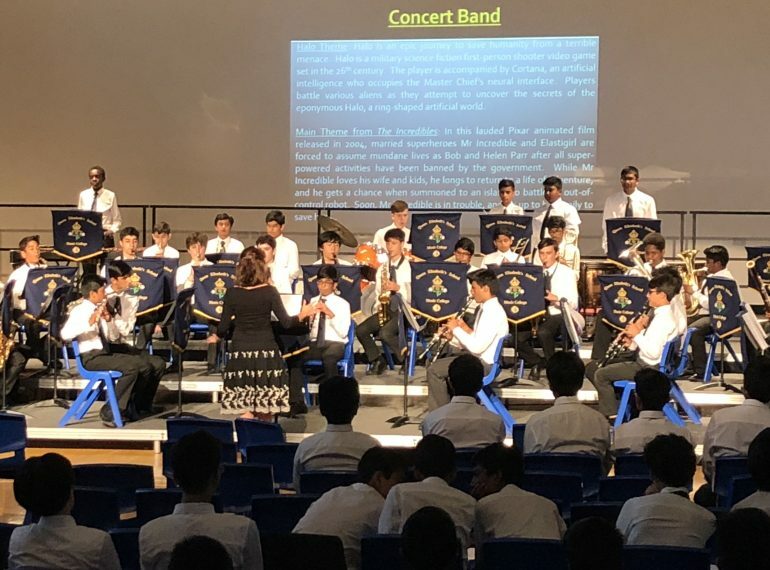 She pointed out that many members of the Concert Band in particular had not yet progressed beyond grade 2, yet had performed well, the concert providing them with valuable opportunities to improve skills such as sight-reading. The concert featured diverse music from the world of show business, including hits from The Greatest Showman (the 2017 musical film about American showman and circus impresario P T Barnum), the jazz classic, In The Mood, and, of course, the iconic Queen song borrowed for the concert’s title. Other well-known pieces of music in the programme ranged from the Allegro in Mozart’s Eine Kleine Nachtmusik, performed by the Flute Ensemble, to the Pirates of the Caribbean theme tune, played by the Celli. 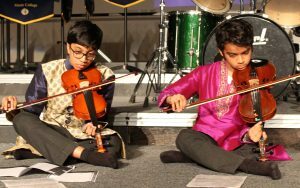 The Junior Indian Ensemble performed Paapanaasam Shivan’s Singara Velavan. Headmaster Neil Enright evoked Nelson Mandela as he urged QE’s young prize-winners to embrace both optimism and persistence. Mr Enright congratulated the award-winners and explained how they could learn from the former South African President and 1993 Nobel Peace Prize-winner, speaking on what would have been his 100th birthday. 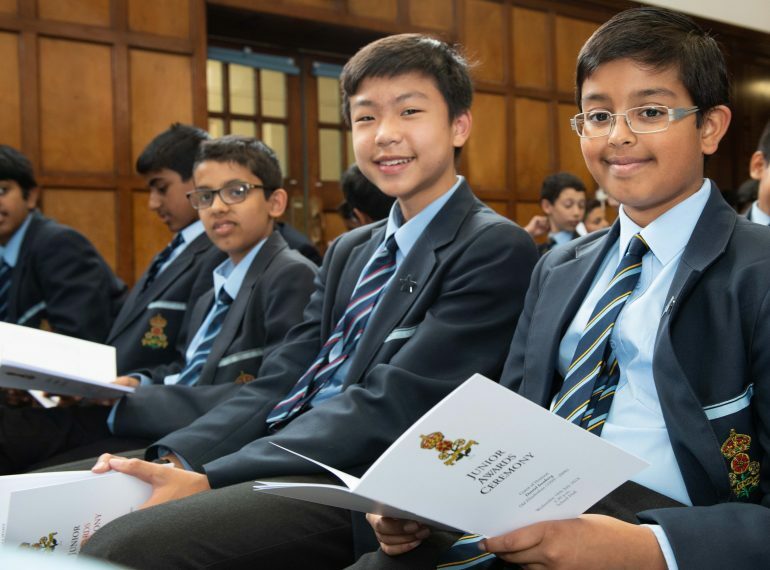 Almost 120 prizes were awarded at the 2018 Junior Awards Ceremony to boys from Years 7–9 across a broad range of categories that included not only academic subjects, but also House prizes and awards for sport, the performing arts and service. 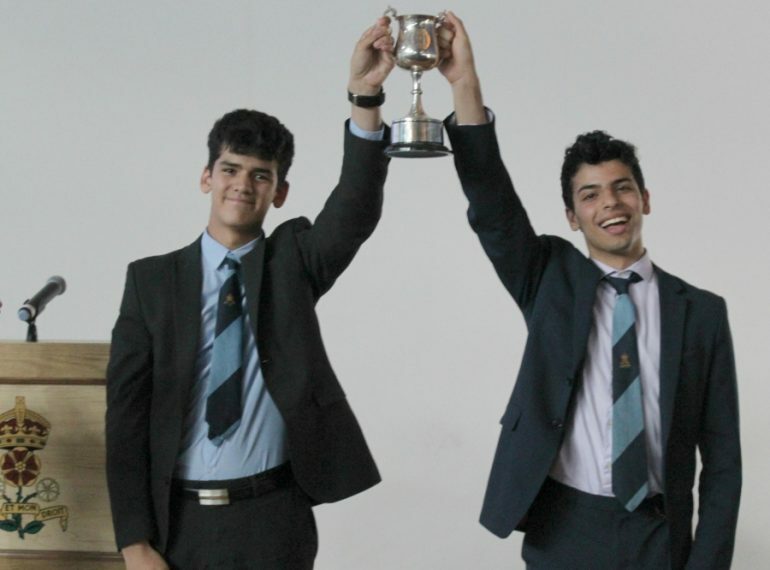 The Headmaster pointed out that the boys receiving awards had achieved double success, firstly by securing a place at the School (more than 2,400 boys sat last year’s entrance examination) and then by winning a prize. “You have been the best of the best in your year groups for the respective subjects, extra-curricular activities and contributions to school life for which prizes are being given. You should therefore be very proud of what you have achieved,” he said. Just as Mr Mandela had spoken of “keeping one’s head pointed towards the sun, one’s feet moving forwards”, the boys should “keep taking those forward steps” and should also be “highly, but realistically, ambitious”. Warning pupils against “complacency and hubris”, Mr Enright added: “Being humble, modest and grounded – when coupled with hard work and an inner confidence – is a safe pathway to success, and these are characteristics happily common among QE boys.” And he alluded to Nelson’s Mandela’s axiom that “a good head and a good heart are always a formidable combination”. 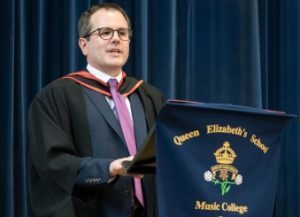 The guest speaker at the afternoon ceremony in the School Hall was Old Elizabethan Daniel Isenberg (1999–2006), a young barrister who studied at Cambridge and Harvard and was also Judicial Assistant to Lord Sumption and Lord Carnwath at the Supreme Court. Other VIP guests included Chairman of Governors Barrie Martin MBE and the Mayor of the Borough of Barnet, Councillor Reuben Thompstone. The ceremony was enhanced by music performed by the boys, including three pieces from British composers – Samba Triste from Three Piece Suite by Sir Richard Rodney Bennett, Promenade from Le Tombeau de Couperin by John McLeod and Hypnosis by Ian Clarke. The final vote of thanks was given by Ugan Pretheshan, winner of the Year 7 Public Speaking Award. Afterwards, boys and their parents enjoyed refreshments with the Headmaster, staff and guests. Alumnus and former QE teacher Tim Adnitt is now firmly established with a multinational music technology company, while continuing to work very successfully as a record producer and sound engineer. Tim (OE 1988–1995) is a Product Owner for Native Instruments, leading teams in London and Berlin for the German company, which creates software and hardware for computer-based audio production. He has also worked on several award-winning albums, including Saluting Sgt. Pepper by British musician Django Bates, in collaboration with Frankfurt Radio Big Band and Eggs Laid By Tigers. This creative re-imagining of the Beatles’ seminal LP was named The Times & The Sunday Times 2017 Jazz Album of the Year. 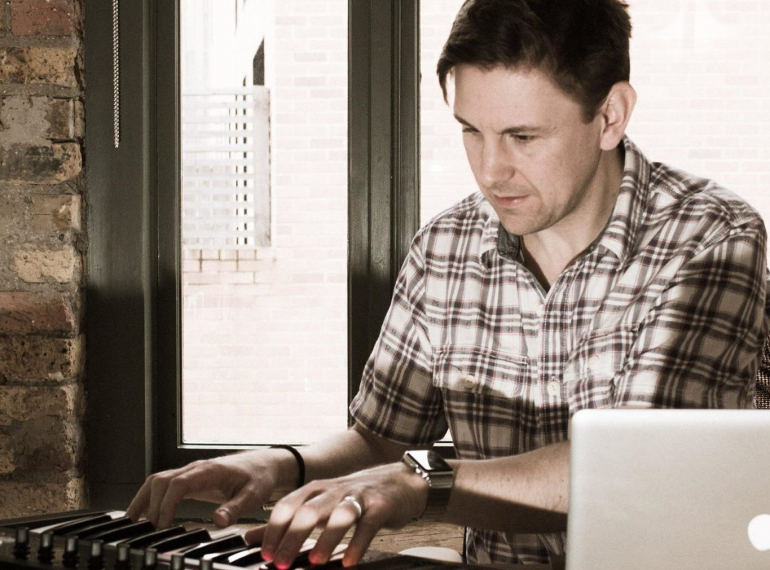 As a composer, Tim has written music for the Royal Opera House, the Royal Shakespeare Company and the Globe Theatre. His work centres on Komplete Kontrol, the award-winning keyboards used by many of the world’s leading composers and producers including Stevie Wonder, Herbie Hancock, Jean-Michel Jarre, Hans Zimmer, Junkie XL, John Powell, Noah Shebib, Jacob Collier and Justin Kauflin. He played a key role in the creation of Native Instruments’ Native Kontrol Standard (NKS), the de facto industry standard for browsing and hardware control of virtual instruments and effects. Tim is known as an advocate for accessibility in music technology, working to promote a change in mindset across the industry towards musicians and producers with disabilities. 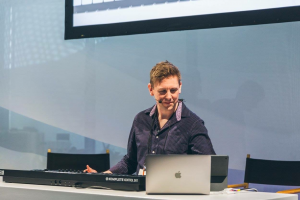 He co-designed Komplete Kontrol’s accessibility features for visually-impaired musicians. Tim has spoken at numerous events and conferences around the world on this topic, including: last year’s Audio Developer Conference in London; Moogfest 2018 in North Carolina, USA (where he co-presented a workshop with Stanford University’s Thinking Matters Fellow, Tiffany Naiman), and Berklee College of Music Accessibility Conference 2018 in Boston, USA. He is supported at Native Instruments by fellow Old Elizabethan and former Music Technology student Adil Ghanty (2003-2010), who joined the company in summer 2015 – an appointment that is “testament to the strong tradition of Music and Music Technology at QE,” Tim says. After leaving QE, Tim read Music at City, University of London, before going on to take a Master’s degree in Composition. Tim taught Music Technology at the School between 2005 and 2014. With well over 100 musicians performing, this summer’s major concert amply demonstrated the strength of Music at QE. Entitled Into the Future, the event in the Shearly Hall featured 11 different ensembles, many of which played pieces with a futuristic theme. The Summer Orchestra began the concert with two pieces by the American composer, Leroy Anderson. 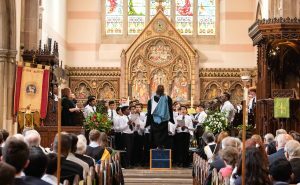 The biggest ensemble of the evening was the School Choir, involving some 70 boys, many of whom also performed as instrumentalists during the concert. They sang OneRepublic’s 2013 hit, Counting Stars, composed by Ryan Tedder. Also turning out in force were the Concert Band, who brought the evening to a close with the theme from The Incredibles, the 2004 animated film blockbuster. The classical western repertoire was also in evidence, with the Celli playing Borodin’s Notturno from his String Quartet no. 2 in D and the String Quartet performing the Adagio from Mozart’s String Quartet no. 1 in G.
Pupils past, present and even future all helped make the 2018 Queen Elizabeth’s School Founder’s Day a resounding success. The day, a great highlight of the School’s summer calendar, included a morning church service and subsequent ceremonial proceedings, before culminating in the popular afternoon fete on Stapylton Field. Headmaster Neil Enright said: “This was a splendid and enjoyable day and it was a great pleasure to see everyone, from boys and their families who are set to join the School in Year 7 in September right through to the Old Elizabethans spanning several generations who came along. The day got off to a stirring start with the School Choir’s rendition of Handel’s coronation anthem, Zadok the Priest, performed as the introit in Chipping Barnet Parish Church. 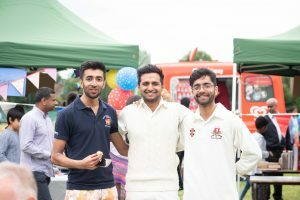 The service included hymns and Bible readings, including from the current School Captain, Aashish Khimasia, and his predecessor, Oliver Robinson, as well as the traditional Founder’s Day prayer, concluding with the petition that “our School may endure as a home of sound learning and of true godliness”. 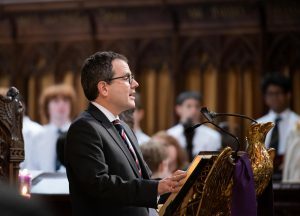 Guest speaker for the service was Major Charles Russell (OE 1997–2004) who spoke on the theme of service, reflecting on QE’s “rich history of military service” and pointing out that 2018 marks the centenary of the end of the First World War. He went on to articulate how service to others is demonstrated throughout the Elizabethan community. 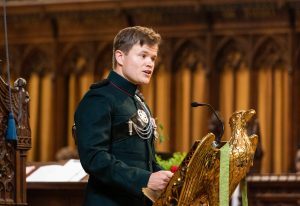 Major Russell told the congregation of boys, staff and VIPs of his experiences in 2010, when he and a fellow soldier were very seriously injured in Afghanistan, where he was serving with The Royal Gurkha Rifles. “We were on the operating table in Camp Bastion within 25 minutes of the blast, and back in Birmingham two days later. 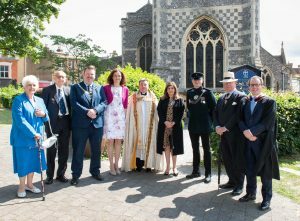 Guests at the service included Major Russell’s father, Martin Russell, who is Representative Deputy Lieutenant for the London Borough of Barnet. Also in the congregation were: the Mayor of Barnet, Cllr Reuben Thompstone; local MP Theresa Villiers and Queen Elizabeth’s Girls’ School Headteacher Violet Walker, as well as QE governors, former members of staff, parents and boys. 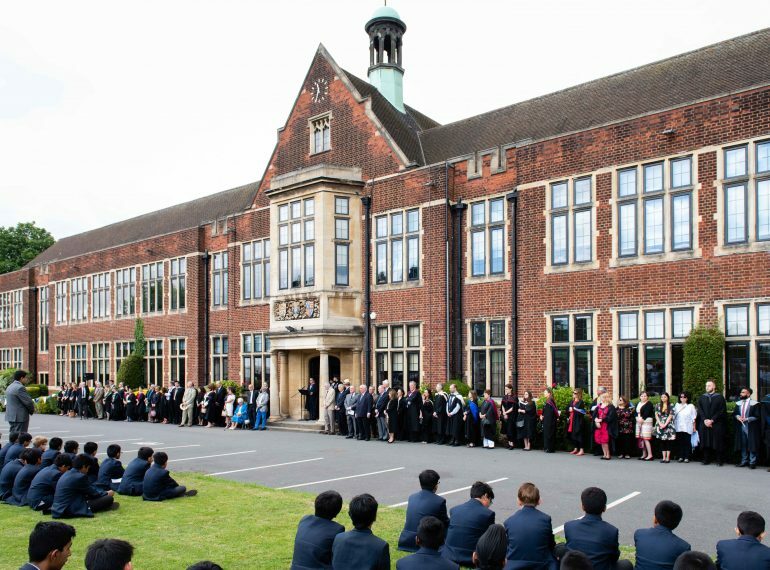 After the service, the day continued, in accordance with cherished QE tradition, with the roll call and the reading of the School Chronicle in front of the main building. 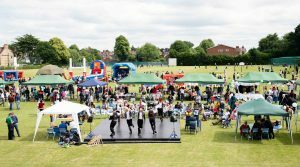 Then it was time for the fete, organised by the Friends of Queen Elizabeth’s, to get into full swing, to the accompaniment of the School Concert Band. 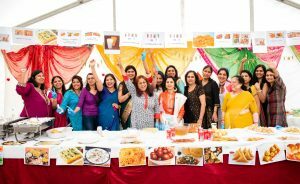 Among the many stalls, activities and attractions, the International Food Tent proved as popular as ever – takings for the Sri Lankan curry alone reportedly topped £4,000! These sales helped the FQE raise a total sum for the day provisionally put at around £21,000. The afternoon also saw the annual Stanley Busby Memorial Cricket Match between old boys of the School and the current First XI. Played on the Third Field at the rear of the School, it was this year won by the pupils after a close encounter with a strong team of OEs. A good many other Old Elizabethans attended the formal aspects of the day, the fete and the cricket, with some having travelled a considerable distance in order to be there. Fifty years after the assassination of Martin Luther King, QE’s Music department commemorated the civil rights leader with a concert based on the themes of his most famous speech, I have a dream. The event in the Shearly Hall was the final major concert for the Year 13 leavers, representatives of whom made speeches and presented gifts to Miss Horne and her fellow Music Department staff, Jen Brown and Tom Jack. A number of boys were also presented with Senior Music Colours. Headmaster Neil Enright said: “It was an excellent evening; I was particularly impressed with the scale of the current School Schoir and how they filled the stage.” The choir performed Man in the Mirror, composed by Glen Ballard and Siedah Garrett, but made famous by Michael Jackson. The repertoire ranged from reggae to Beethoven and was performed by an array of ensembles and bands. From the Barbershop group’s rendition of One love/People get ready to the Symphony Orchestra’s performance of The world in unity, the themes were frequently revisited. The concert opened with Benjamin Britten’s Fanfare for St Edmundsbury, performed by the Trumpet Trio, and closed with the Chamber Choir’s offering of selections from the musical, Hairspray. Although it sat outside the overall theme for the night, the winning entry from the inter-House Music competition was also performed – Pearce’s arrangement of I’ve had the time of my life, from the 1980s film, Dirty Dancing. Run recently for the first time in five years, the reformatted contest featured specially formed ensembles drawing boys from across all year groups. Each House’s ensemble had to choose a piece based on the theme of the Oscars and then arrange and rehearse it. 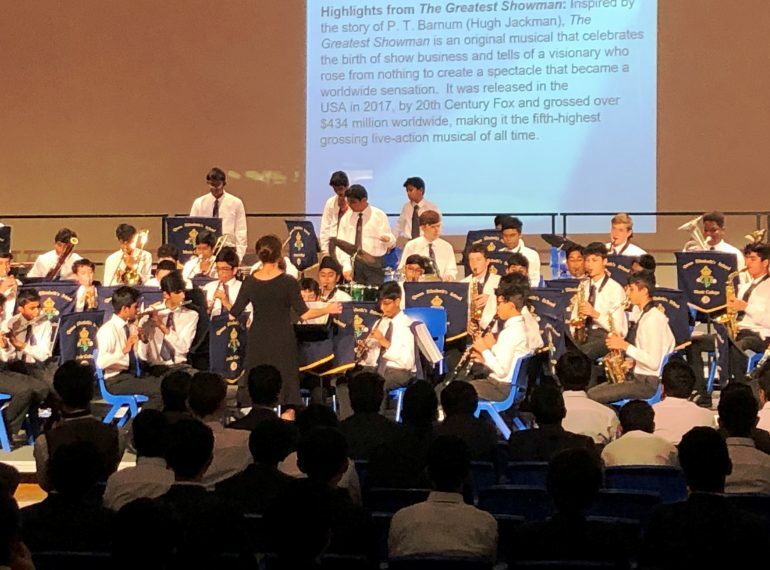 The competition culminated with a performance of all the pieces to the whole Lower School (Years 7-10) at a special assembly in the Shearly Hall. 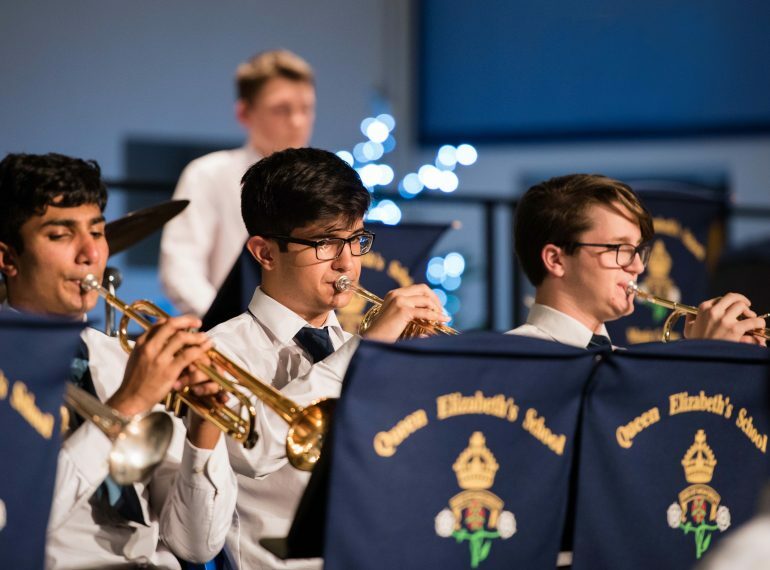 QE’s musicians sounded the start of the School’s festive countdown in grand and seasonal style with the 2017 Christmas Concert. 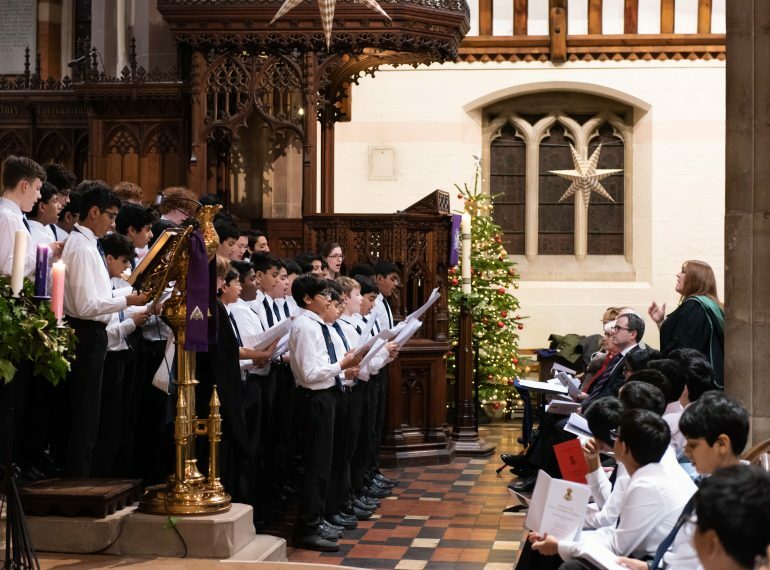 Governors and other VIP guests joined parents and staff flocking to the Shearly Hall, where the School’s choirs led the audience in favourite carols and QE’s leading instrumental ensembles performed an eclectic selection ranging from Handel to Humperdinck’s Hansel and Gretel. Headmaster Neil Enright said: “It was a wonderful concert, demonstrating once again the strength and depth of participation in Music at QE. “The tenors and basses of the School Choir – now outnumbering altos and trebles for the first time – brought a real richness of sound with their performances of Barbara Ann (made famous by the Beach Boys) and the traditional Sinner Man, arranged by Roger Emerson. “The Saxophone Ensemble’s excerpt from West Side Story and their rendition of Jingle Bells were of particularly high quality, while the Symphonic Winds (a new name for the former Concert Band) produced another highlight, their Selections from Home Alone evoking memories of what has become a Christmas film classic. “It was fitting that this enjoyable evening was punctuated by the presentation of Senior and Junior colours to boys for their commitment and excellence,” the Headmaster added. Director of Music Cheryl Horne and her colleagues directed most of the larger ensembles, while some other performances were pupil-led – the Senior Indian Ensemble, the Wind Quartet and the Barbershop group. The String Camerata is led by recent old boy Simon Purdy (2009–2016). J Iveson – whose arrangement of Christmas songs, entitled Christmas Crackers, was performed by the Brass Ensemble. Among the distinguished guests were Cllr Wendy Prentice, representing the Mayor of the London Borough of Barnet, who was accompanied by Cllr Bridget Perry. Both are councillors for the High Barnet ward in which the School is situated. The concert was held in association with the Rotary Club of Barnet, with which the School has enjoyed links for many years. The printed programme opened with a note of welcome from Brian Coleman, Old Elizabethan (1972–1979) and President of the Barnet Rotary Club.